There will be fair, bright skies over the city today with cooler temperatures. Today’s high will only reach 74° with the low tonight about 60°. A day trip to the sea shore will be more expensive beginning this weekend. 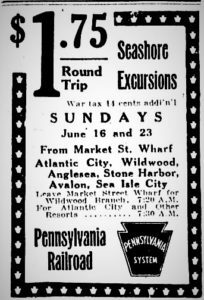 Both the Pennsylvania Railroad and the Reading Railroad have raised the rates for a day trip ticket to $1.75. The one day fare was raise to $1.25 in April. This new increase is, according to the railroads, due to the rise in fuel costs because of the war. The two railroads have also agreed to avoid duplication in their routes. 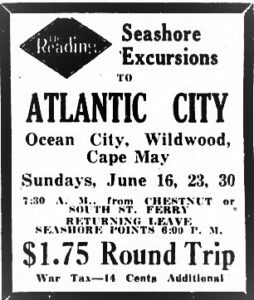 Pennsylvania Railroad will give up excursion trips to Cape May and Ocean City while Reading Railroad will drop Sea Isle City. Mr. Herbert Hoover, Director of the United States Food Administration, has issued an order limiting the amount of beef that can be consumed by hotels, restaurants and also by households. The household ration amounts to a limit of 1 ¼ pounds of beef per week for each member of the family. There is no limitation on pork, fish, mutton, bacon, sausage, ham, veal or poultry. Hotels and restaurants are limited to serving beef only once a week. Mr. Hoover declared that the order was necessary to ensure enough beef for the American and Allied soldiers fighting overseas. In sports, at the Point Breeze Motordrome tonight a number of races are on the schedule. The featured race is a 1 hour motor-paced race for distance with four of the best riders in the country. They are Percy Lawrence, Georgy Wiley, Clarence Carman and Frank Corri. In addition to this bicycle race there will also be two motorcycle races and an amateur bicycle contest. In baseball the Phillies are hosting the St. Louis Cardinals at National League Park. The game begins at 3:30pm. Yesterday’s game was rained out. The Athletics are out in Detroit where yesterday they played in front of the smallest crowd in Navin Field history. Only about 300 people showed up for the contest which the A’s won 4 to 3. The A’s finish their series in Detroit this afternoon and then head to Cleveland. Today’s casualty list contains the names of two Philadelphians. Marvin Podgurski of 613 Galloway Street is listed as severely wounded and Lieutenant Raymond C. Burke of 591 Walnut Street is listed as missing. Also listed is Private George William Dell of Malvern who has died from his wounds. The full report lists 19 killed in action, 9 died from wounds, 4 dead from disease, 1 death from airplane accident, 3 dead from other accidents, 137 wounded severely, 11 slightly wounded and 4 missing in action. A mighty battle is raging over a 75 mile front from Montdidier on the Picardy plains to Chateau-Thierry on the Marne River. The battle is constant with attack and counter-attack. The French for now have held the German assault to only minor gains of ground. However, the French have fallen back from Carlepont Wood on the east bank of the Oise River for defensive purposes.